Allright. Graffiti artists and people with funky fashion senses worldwide rejoice. 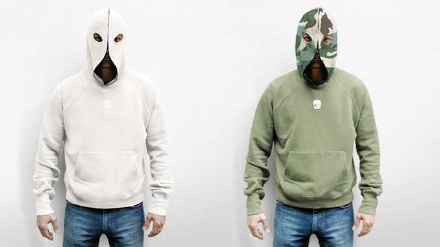 Someone’s gone out and made these very striking hooded sweatshirts. By someone, I think I mean french brand Anticon, but seeing as I can’t find their site, or any more information aside of this fine picture, it really could be anyone. If we’re to believe Yvan from The Cool Hunter, these things are only going to be released in a few more weeks. No price, no site, no nothing. Just enjoy the picture. Update: Ah, there we go. Anticon’s site, replete with extra pictures. I love it; very ghetto.